Monthly club meetings are held on the third Tuesday of every month (except April) at 7:00 PM in the Camellia Room at The Gardens at Heather Farm, 1540 Marchbanks Drive, Walnut Creek, Calif. (Doors open at 6:30 p.m.). Fly Casting Instruction is available prior to each meeting, at the Heather Farm pond from May through October, starting at 5:45 p.m.
Our meetings feature top quality guest speakers and/or professional fishermen presenting their programs in their areas of expertise. 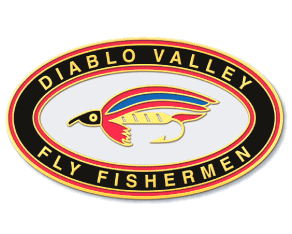 Current and local fishing news, video rentals, raffles, demonstrations of fly tying, rod building, casting, conservation and sharing ideas and stories with fellow members round out the evening. You can see a list of future meetings via this link. Our Board Meetings are held on the second Tuesday of every month (except September) at The Gardens at Heather Farms in Walnut Creek at 7 p.m.